We’re quite a sizeable branch, with one of the largest selections of Barn Paint colours in the Brewers family, and an impressive choice of other brands too. If there’s anything you want that Brewers sells and we don’t have on the shelf, we’ll usually have it in branch with your name on it the very next day. In the meantime, grab a coffee, peruse the paints and quiz our team on any interiors questions you may have. Or music, or cars, or squash, or exotic pets… paint isn’t our only passion here. 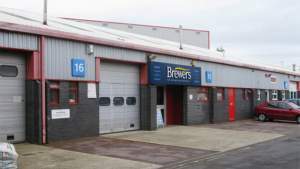 Our Ashford branch in Kent, just past the fire station on Henwood Industrial Estate, is as well known to local homeowners as it is professional painters and decorators. That’s probably because of our first-rate paint-mixing facilities, but the smell of freshly brewed coffee is also a significant draw.